MTHFR: What the Bleep is It? If you’ve heard of MTHFR and have no idea what it is and feel like you should, of if you’ve discovered that you have this genetic change and are shaking in your boots, this article will help clear up your concerns and give you clear guidance on how to handle it for your best health. Wow, if ever a gene is having its day in the sun it’s the MTHFR. My Facebook Live on the topic drew 20,000 views in 2 days. I get questions about this popular topic from most of my patients, and emails about it regularly. I’m not quite sure how MTHFR became so famous – perhaps it’s the humorous acronym (look at it long enough if your brain doesn’t automatically fill in the missing letters), the popularity of 23andme genetic testing, or the very real risks it carries. But clearly, there are a lot of questions about it. And it’s an important gene, with significant consequences for some who have it. In this article (and in the audio recording of the Facebook Live event, which you’ll find posted below if you prefer to listen), I’m going to explain what MTHFR is, why it’s important in your body, what it means if you have the genetic change, whether and how to get tested if you don’t know if you carry it, what to do if you do. Hopefully I will also dispel your worries, because this is a very manageable issue with straightforward prevention steps you can take. The MTHFR gene provides the code for a specific set of instructions your body uses to make an enzyme called methylenetetrahydrofolate reductase – yes, a mouthful – so we all call it MTHFR. Wait, what’s a gene? And what’s an enzyme? Let’s review these concepts first. Genes, which are made up of DNA, are the basic units by which heredity happens – that is, the transfer of your genetic blueprint from your parents to you. They are present in all of your cells (except your red blood cells), and provide your body with the instructions for assembling all of your basic structures via protein formation. The Human Genome Project estimates that we humans have somewhere between 20,000 and 25,000 genes, each of which is made up from a few to thousands of sequences of the genetic building blocks called nucleotides. Each of us is gifted with two copies of every gene, one copy of each inherited from each of your biological parents. These pairs are called alleles, and we all have basically the same number of genes, coding for the same proteins, with variations in some genes that give us our unique height, eye color, and other “traits.” We also have basically the same genes that program our biological functions, but even there, we can have variations. The most obvious differences occur when there are serious genetic variations that can occur by accident or damage in the reproductive process and lead to birth defects or diseases. 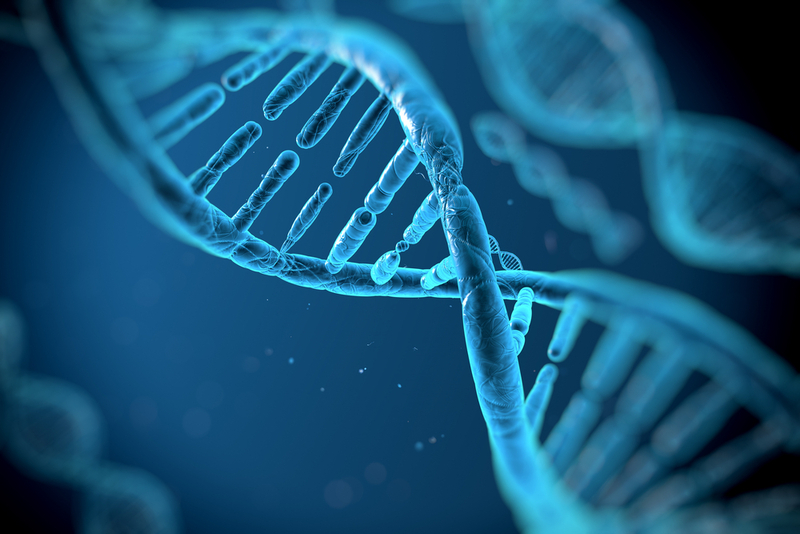 We also can have less serious variations in the sequences of our genes, whereby one of the smallest particles that make up our DNA, the nucleotides, gets dropped or swapped one for another, in one of the alleles. These changes are called SNPs, short for single nucleotide polymorphisms. However, unlike genetic defects that lead to diseases, the SNPs associated with the MTHFR gene don’t automatically cause disease or medical problems- they are changes that are modifiable with lifestyle and nutritional approaches that I’ll share with you in this article so you can prevent problems. Enzymes are substances that “catalyze” reactions – which means they cause a chemical reaction to happen, for example, the formation or breakdown of proteins to make the structures that perform most of the functions in your body. MTHFR is an enzyme necessary for a number of important chemical reactions, as you’re about to discover. MTHFR is involved in a series of chemical reactions necessary for your body to properly use folate (vitamin B9) and, as part of a multistep chemical sequence, transforms a by-product of this process, homocysteine, which has been associated with intravascular inflammation and most of the medical problems associated with MTHFR SNPs, into the amino acid methionine, an important building block in protein formation and required for the formation of S-adenosylmethionine (SAM-E), a universal methyl donor for almost 100 different substrates, including DNA, RNA, hormones, proteins, and lipids. What’s a methyl donor? It’s a carrier that contributes a methyl group (unromantically, a carbon atom attached to three hydrogen atoms), to a biological reaction in your body. Methylation is a process whereby one molecule passes a methyl group to another molecule, a process that occurs in your body millions of times each minute. Methylation is responsible for genetic expression – activating (turning on) and silencing (turning off) specific genetic sequences. When a gene sequence is turned on that should be off, or turned off that should be on, the consequences can be serious – for example, cells are programmed to die when they are damaged – a process called apoptosis – if the sequences in this process are altered, damaged cells may, instead of automatically self-destructing as they are supposed to, continue to replicate. Another term for excessively replicating damaged cells? Cancer. Which is why MTHFR SNPs are associated with possible increased risk of cancer. Methylation is also essential for detoxification processes to occur properly, and is necessary for the production of glutathione, one of the most important natural detoxification agents in our body. Thus the combination of decreased detoxification in our current environment with over 80,000 circulating chemicals, few of which have been tested for human safety, presents a potentially greater challenge and risks to the health of individuals with MTHFR SNPs, especially C677T. Further, properly functioning MTHFR is also necessary for the utilization of vitamin B12, and MTHFR SNPs have been associated with vitamin B12 deficiency. Vitamin B12 is required for proper red blood cell formation, neurological function, and DNA synthesis. While there are at least 40 variations in the MTHFR genes, the two that at this time we know carry the most significance for human health and potential disease are the MTHFR genes known as A1298C and C677T. Because we have one copy of each from each of our parents, we can have one or two variations in either. In fact, SNPs are incredibly common – about 30-45% of the population has one SNP in one or the other, and 10% of us have two variations in one or the other. If you have one change in either gene, this is referred to as your being heterozygous for the SNP (often notated as +/-); if you have two changes in either gene, you are considered homozygous for that SNP (often written as +/+). So you can be either +/- or +/+ for A1298C, and/or +/- or +/+ for C677T. One or even two changes in A1298C usually doesn’t usually lead to any health or medical consequences, though it merits awareness, while changes in C677T can, with two changes presenting the greatest likelihood of potential risk. Emphasis on the word potential – which I’ll come back to shortly. Fertility problems, miscarriage, Pregnancy Induced Hypertension (PIH), pre-eclampsia, and placental abruption. Vitamin B12 deficiency which can cause megaloblastic anemia, fatigue, weakness, constipation, loss of appetite, weight loss, neurological changes such as numbness and tingling in the hands and feet, difficulty maintaining balance, depression, confusion, dementia, poor memory, and soreness of the mouth or tongue. Should You Get Tested? And What Tests? Conventional testing is readily available for the MTHFR SNPs themselves, and also for plasma homocysteine, B12, and folate levels. Any licensed provider can order these for you – though they are not necessarily all covered by insurance. Independent labs such as Genova and Doctor’s Data also offer these labs; I recommend reviewing your results with a knowledgeable medical practitioner before jumping to scary conclusions or jumping onto the high dose supplement bandwagon. However, it’s very important to remember that the presence of an MTHFR SNP does not mean you are automatically at risk for any of the symptoms or conditions I’ve mentioned, and does not automatically mean you need supplementation to offset the potential risks. That’s all they are: potential risks. The presence of the gene alone doesn’t mean that the enzyme won’t function well. It can’t tell whether you personally are methylating well or poorly, for example, and whether you personally need additional support. And in fact, excess supplementation has it’s own risks! All women of childbearing age and specifically, all women trying to conceive, and women who have had a prior child with MTHFR-related birth defects or behavioral challenges or autism. Any patients with symptoms or a personal or family medical history that could be attributed to an MTHFR SNP, i.e., depression, heart disease, stroke, children born with neural tube defects, and any of the symptoms/conditions I’ve mentioned previously. Children with behavioral challenges or on the autistic spectrum (I check for SNPs, B12 levels, and elevated homocysteine). So you’ve gotten tested and discovered that you have an MTHFR SNP and now you wonder what you should do. First – don’t panic! For one, just having the SNP doesn’t portend gloom or doom, and if you do have the SNP there are things you can do to protect your health. Essentially, if you have the MTHFR SNP, you can’t get your folate into its methylated form, because your methylation pathway isn’t working, and then you can’t recycle your homocysteine back into methionine. It’s a bit like you need to get from Train Station A to Train Station C, but Station B is out of order. You need to hop a cab to get around the obstacle. Methylfolate is an already methylated form that allows you to bridge the gap without the functioning enzyme. From there, the rest usually takes care of itself. Read below for your specific needs. If you have the A1298C SNP and no other issues or lab abnormalities, while technically current studies show no need for supplementation, I still recommend 400 mcg of methylfolate daily as it is protective, there’s no harm at all, and we’re still learning about the potential for these SNPs to be associated with disease. If you have the C677T SNP, whether you are heterozygous or homozygous, and you have no other issues or lab abnormalities, I recommend a lifelong maintenance dose of 400 to 800 mcg of methylfolate daily depending on your family risk factors. In women of childbearing age, in order for folate (the naturally occurring form from plants), folic acid (the synthetic form), and methylfolate (the methylated form you need if you have the SNP) to have a protective effect against neural tube defects, it has to be taken during the first month of pregnancy – neural tube closure happens by 28 days of pregnancy – often before a woman even realizes she’s pregnant. Therefore, all women of childbearing age should be taking a supplement with 400-800 mcg of methylfolate specifically if she has the SNP or doesn’t know, because the other forms will not only not provide her the form her body can utilize, but may actually be counterproductive. Then throughout pregnancy, the same dose should be maintained, and I go up to 1mg/day in women with a history of fertility challenges, miscarriage, or any of the pregnancy complications I mentioned above, or a child with any birth defects, behavioral challenges, or autism. Discovered that you have MTHFR & wonder what you should do? First – don’t panic! There are solutions! In my patients with elevated homocysteine I recommend supplementing with 800 mcg- 1 mg. of methylfoate daily, while trending homocysteine levels every 3-6 months until they are down to within normal range (< 8), and then staying on a lifetime maintenance dose of 400 to 800 mcg, unless additional dosing is recommended by your medical provider. If you are seeing a functional medicine practitioner, you may have been told you have elevated FIGLU – this is also a marker of trouble with folate metabolism, and is also suggestive of the need for homocysteine testing and methylfolate supplementation. If your testing shows that you are low in Vitamin B12, you’ll want to make sure you’re getting ample sources of vitamin B12 in your diet, and supplement with methyl-B12 (methylcobalamine) as needed, however, without adequate methylfolate, you might not be able to utilize your B12 fully. Sometimes, individuals struggling with depression need higher doses of methylfolate, even up to several milligrams daily, however, when exceeding 1 mg./day dosing I suggest working in conjunction with your medical provider. Over-supplementation of methylfolate can mask Vitamin B12 deficiency. Should I Test and Treat My Kids? As mentioned above, I test children on the spectrum and with significant behavioral issues for MTHFR, homocysteine, and B12. Otherwise, I don’t routinely test kids under 2, or older kids. For kids that do test positive, and have medical issues, I supplement with 50-400 mcg of methylfolate depending on age, and I supplement with methylB12 accordingly. I recommend working with a functional medicine pediatric practitioner. For reasons beyond the scope of this article to discuss, individuals with Histamine Intolerance may find that methylated B vitamins act as a symptom trigger; in this case I supplement with SAM-E and trend homocysteine levels. If this is the case with you, I recommend working directly with a functional medicine practitioner experienced with histamine intolerance. Geneticists have an expression: nature loads the gun, environment pulls the trigger. While having the MTHFR SNP may in itself inherently pose some risks that require you to supplement with methylfolate and methylB12, it’s important to also remember that just having the gene doesn’t necessarily increase your risks over the next person who doesn’t, and that we’re all at risk due to the overwhelming number of environmental toxins we’re facing in the setting of overall nutrient depleted diets. Skipping meals, skimping on veggies, and not getting enough phytochemicals in our diets, while also not getting enough sleep and being under undue stress and chronic overwhelm put us at just as much risk if not more, of health problems. And if you do have a genetic risk, you’ve got a double whammy. So regardless of our MTHFR status, we all need to be mindful of supporting our elimination and detoxification pathways, avoiding the toxin exposures within our control in our diets, households, and body products, and leading healthful, mindful lives. Adding in a multivitamin with methylfolate, or supplementing a modest amount daily, is a safe and appropriate strategy even if you’re unable to get any testing and want to maximize your health protection. Bjelland, I. et al. Folate, Vitamin B12, Homocysteine, and the MTHFR 677C→T Polymorphism in Anxiety and Depression-The Hordaland Homocysteine Study. Arch Gen Psychiatry. 2003;60(6):618-626. Bhargava S, Ali A, Parakh R, Saxena R, Srivastava LM. Higher incidence of C677T polymorphism of the MTHFR gene in North Indian patients with vascular disease. Vascular. 2012 Apr;20(2):88-95. Botto LD, Yang Q. 5,10-Methylenetetrahydrofolate reductase gene variants and congenital anomalies: a HuGE review. Am J Epidemiol. 2000 May 1;151(9):862-77. Khandanpour N, Willis G, Meyer FJ, Armon MP, Loke YK, Wright AJ, Finglas PM, Jennings BA. Peripheral arterial disease and methylenetetrahydrofolate reductase (MTHFR) C677T mutations: A case-control study and meta-analysis. J Vasc Surg. 2009 Mar;49(3):711-8. doi: 10.1016/j.jvs.2008.10.004. Kumar A, Kumar P, Prasad M, Sagar R, Yadav AK, Pandit AK, Jali VP, Pathak A. Association of C677T polymorphism in the methylenetetrahydrofolate reductase gene (MTHFR gene) with ischemic stroke: a meta-analysis. Neurol Res. 2015 Jul;37(7):568-77..
Moll S, Varga EA. Homocysteine and MTHFR Mutations. Circulation. 2015 Jul 7;132(1):e6-9. doi: 10.1161/CIRCULATIONAHA.114.013311. Shiran A et al. Association of Vitamin B12 Deficiency with Homozygosity of the TT MTHFR C677T Genotype, Hyperhomocysteinemia, and Endothelial Cell Dysfunction. Isr Med Assoc J. 2015 May;17(5):288-92. Sibani S, Christensen B, O’Ferrall E, Saadi I, Hiou-Tim F, Rosenblatt DS, Rozen R. Characterization of six novel mutations in the methylenetetrahydrofolate reductase (MTHFR) gene in patients with homocystinuria. Hum Mutat. 2000;15(3):280-7. Trabetti E. Homocysteine, MTHFR gene polymorphisms, and cardio-cerebrovascular risk. J Appl Genet. 2008;49(3):267-82. Trimmer EE. Methylenetetrahydrofolate reductase: biochemical characterization and medical significance. Curr Pharm Des. 2013;19(14):2574-93. Urreizti R, Moya-García AA, Pino-Ángeles A, Cozar M, Langkilde A, Fanhoe U, Esteves C, Arribas J, Vilaseca MA, Pérez-Dueñas B, Pineda M, González V, Artuch R, Baldellou A, Vilarinho L, Fowler B, Ribes A, Sánchez-Jiménez F, Grinberg D, Balcells S. Molecular characterization of five patients with homocystinuria due to severe methylenetetrahydrofolate reductase deficiency. Clin Genet. 2010 Nov;78(5):441-8. Xie SZ, Liu ZZ, Yu JH, Liu L, Wang W, Xie DL, Qin JB. Association between the MTHFR C677T polymorphism and risk of cancer: evidence from 446 case-control studies. Tumour Biol. 2015 Nov;36(11):8953-72. Yadav U, Kumar P, Yadav SK, Mishra OP, Rai V. “Polymorphisms in folate metabolism genes as maternal risk factor for neural tube defects: an updated meta-analysis”. Metab Brain Dis. 2015 Feb;30(1):7-24. Yan L, Zhao L, Long Y, Zou P, Ji G, Gu A, Zhao P. Association of the maternal MTHFR C677T polymorphism with susceptibility to neural tube defects in offsprings: evidence from 25 case-control studies. PLoS One. 2012;7(10):e41689. Awesome article. I think you mean mcg and not mg, yes? I am curious on the dosing of the Methylfolate. When I search it, I find L-methylfolate or 5-methylfolate, and the dosing forms are 2.5-15mg capsules, which is far from the 400-800mg daily that you recommend in your article. Do you have a recommended product or "form" that I should look for? Or advice on dosing with this form? Please see all corrected doses - mcg were erroneously mistyped as mg, and mg as gm - - all corrected now! This is an AWESOME and easy-to-read article about MTHFR! I am sending the link to my daughters. But, do you mean "mcg" and not "mg" when referring to the dosage of methylfolate? Thanks for sharing this information about MTHFR. You have explained it very clearly. I am wondering, can a health insurance company raise rates or deny coverage to its customers who have this genetic modification? I am ++, but am afraid to have my children tested if it will negatively affect their eligibility for health insurance when they reach adulthood. Thanks for any input that you can give. no they should not be able to. yes! corrected - my apologies - i didn't see that mis-edit throughout my article!!!! and yes, methylfolate can be taken singularly. When you mention the dosing of the methylfolate supplementing, I've only ever seen doses of around 3 mg at most. It seems like you're talking about much higher amounts. Am I reading this correctly? For example, when treating kids you said, "I supplement with 50-400 mg of methylfolate depending on age" . . . Just wondering if you meant the 'mcg' and not 'mg'? Or are there much higher concentrated methylfolate supplements available? Thanks! yes - thank you! the typos were edited!!!! This is why it should be done BEFORE they vaccinate a child..... as it could be one of the reasons so many injuries are being seen. I think you meant mcg instead of mg above several times when referring to the recommended intake of L-5-MTHF in this blog. Also, I appreciate your work and often refer my nutrition patients to your book and website. Thank you for advocating for the precious new babies, babies-to-be and parents trying to conceive an healthy pregnancy! yes thank you! edited the typos!!! I am taking 1 mcg of methylfolate every other day and I am positive for C677T homozygous. My homocystein has been normal but my B12 and folate are usually really high. Is that because of the supplement I am taking by THorne: Methylguard (it has methylated B12 , and folate 3 g for 3 capsules but I take just 1 capsule every other day.) I've already had 2 babies, both healthy, and i never had miscarriage. I eat a very healthy diet, full of folate vegetables and have just started a vegan diet. Your opinion is greatly appreciated. This is such a great article. We found out our 8 month old son has an MTHFR mutation and are still trying to figure out what all of this means. Our dr said he has both mutations and because of this and the fact that that he is a super hyper baby (and had issues like tongue tie, reflux and colic) recommended we do not vaccinate him. Definitely a controversial choice for us as our 3 year old daughter (who we still haven't tested) has been fully vaccinated (although at a delayed schedule). Our son is doing so much better now that he is crawling and we aren't seeing any of the hyperactive issues that worried us in the past and now we're faced with the choice to vaccinate or not. He is in group care and we do plan on traveling with him so are currently trying to decide what to do. Our dr explained because of the defect (it's risks of a reaction from toxins/stress which the vaccines could be) he recommends never vaccinating ever. Any thoughts on this? Thank you for shedding light on this topic, especially for women who are trying to conceive! I found out I am heterozygous for two MTHFR mutations about 6 months ago when I went to a functional medicine provider for some skin issues I was having. Turns out I am also histamine sensitive, which is very interesting. I take 400 mcg methylfolate per day. I also take MethylProtect and 100 mg of acetyl-glutathione every day. Are these safe to take during pregnancy? I have a question about -/- MTHRFR C677T. You do not address that and that is what I have . My Genetic Genie report colors that block as green. What does the -/- mean? -/- usually means you don't have the SNP at all - but check with the coding system on the test you used. Not sure what the green color block represents as ?I don't use that testing brand. Dr. Romm, I am a traditional MD turned integrative (did the AZ fellowship several years ago). It is so refreshing to find your books, articles and podcasts after struggling to make sense of the varying levels of functional medicine advice that is out there. I have a new private practice in Wisconsin. Love love love what you do and how you present it. THANK YOU!! Looking forward to the release of your Botanical Medicine text! This was very helpful! Eleven years ago, after 2 miscarriages it was discovered I was heterozygote 677 (c-t). Around the same time my doctor told me I had the autoimmune disease Polyanalytic Antibody Syndrome. I always thought these were related but now Im not so sure. Can you please tell help me understand this better. I have your book and I love it! I love following the posts written by Dr Romm, I value her knowledable insight and kindness to share it here. This article is no exception in that I have enjoyed it and it is informative. Can we add a disclaimer? I am saddened by this trend to share on MTHFR and encourage people to take methylfolate. Avoid folic acid, yes..... but learning about MTHFR 4 years ago for me was enlightening and life-altering. It caused huge reactions for me, EVEN with working with a qualified practitioner. I took it for pregnancy because I needed folate and what other choice did I have? As a point of observation, lip tie, tongue tie etc were evident and when I stopped methylfolate for the next pregnancy these were not present. Additionally my life has become increasingly hard in food sensitivities due to the histamine intolerance brought on. As I have been pregnant of breastfeeding these last 4 years, I have not been able to take on any kind of detox program to fix my methylation. So "simply taking methylfolate because it can't hurt". Has given me great struggles for the past 4 years that I wish I had back. I wish I never took it.